One method of protecting the building where sloping roofs abut on walls or parapets is by the use of stepped flashings. These are pieces of 5-lb. lead, lying 6 inches on the roof and turned up 6 inches against the brickwork. The upper edges are turned 1 1/2 inch into the joints of the brickwork, and secured with lead wedges as described under the head of flashings. The flashings should be turned 2 1/2 inches up the wall before the lead is cut for the stepping (see Fig. 178). 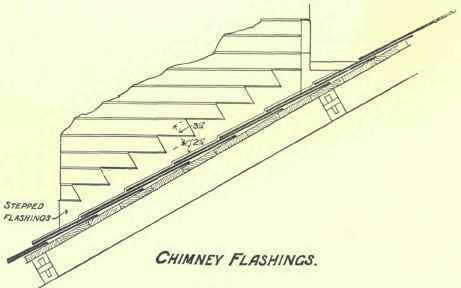 Raking flashings are similar to those before described, except that the lead is secured in a chase cut parallel to the slope of the roof. Fig. 178 shows the mode of keeping out the wet on the four sides of a chimney stack; at the lower end by an apron piece fixed with lead wedges and tacks, at the sides by clipped flashings 6r secret gutters, and at the back by means of a gutter. Secret Gutters are 2 inches wide, laid up sides of chimneys, walls, or hips. In the case of a chimney or a wall the lead is turned up the brickwork and fixed into a raglet with lead wedges. On the other side it is turned over a fillet, and in some cases a hollow welt is formed under the roof covering. The slates are carried over the secret gutter, but as this method does not allow them to be easily cleared it is better to show the slates fixed 2 inches clear of the wall. In some cases the boarding is cut back to give additional depth to the gutter. Side Gutters are often used to convey the water from the upper portion of Mansard roofs, and are preferable to flashings, as there is less likelihood of the wind driving the water under the flashings, especially where the slope of the upper portion of roof intersects the lower portion at an acute angle. 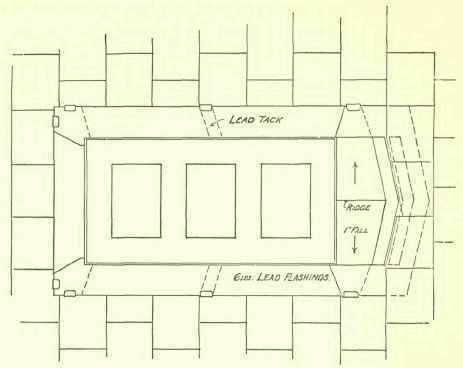 The intersections of sloping roofs with gables, chimneys, or parapet walls are sometimes made watertight by pieces of lead or zinc called soakers, fixed parallel to the wall, resting 4 inches on the slope, and turned up against the walls 2 to 3 inches. A cover, stepped or raking, flashing is fixed over the turned-up edges. Soakers should be the length of the slate, minus the margin, plus 1 inch for clipping over the head of the slates. At times the soakers are turned up against the wall 6 inches, and steps are cut in same and treated as stepped flashings. When the gutters adjoin parapet walls they are termed parapet gutters. These are of two kinds, parallel and tapering. If the rafters are fixed to the wall-plate a tapering gutter is used. Should the rafters be fixed to a pole-plate a parallel gutter must be used, but the pole-plate must be of sufficient depth to allow for the necessary falls and drips. The lead in both cases is turned 6 inches up the walls and finished with a cover flashing, and on the roof side it is dressed over a tilting fillet and rests 3 inches on the boarding beyond. If the rafters are fixed on to the wall-plate a tapering gutter is formed, in a similar manner to that described for tapering parapet gutters, except that the lead is turned up under the slates on both sides of the gutter. Parallel gutters are formed where the rafters are fixed to pole-plates. These are similar to the parallel gutters before described, except that when the gutter exceeds 12 inches in depth an apron piece is used in place of turning the lead under the slates. In the case of M-shaped roofs it is sometimes desirable to take the water through the roof into an adjacent gutter. These are termed box gutters, and are made by forming wrought timber troughs from 4 to 6 inches in width and lining them with lead. Is the method of fixing lead cover flashings of gutters into a stone blocking course. A dovetail groove or raglet is cut into the stone, molten lead is then poured into the groove, and the lead caulked, - that is, driven into the groove with a blunt chisel. When stone cornices or string courses are covered with lead to protect them from the weather it is necessary to secure them so that the wind does not turn up the edges. The lead is laid before the blocking course is built. If the blocking course is of brick the lead is turned into a horizontal joint. Should the wall have been built first, the lead must be turned into a horizontal joint and wedged with lead wedges. To prevent the lead being turned up by the wind, circular dovetailed holes are made in the lead and stone exactly opposite each other, and the edges of the lead around the hole slightly turned up. An iron mould having a small hole in the top is pressed over the hole in the lead and stone, and molten lead is poured through the hole into the stone. This also fills up the cup-shaped hollow in the mould and forms a "lead dot." The Soldered Dot. To form this a circular hollow 3 inches in diameter is formed in the boards. The lead is then well dressed into the hollow and screwed to the boards or studs (studs for preference), a tinned copper washer having been first placed under the head of a tinned brass screw. The copper washer distributes the fixing over a large surface and prevents the lead being torn by the screw when expansion takes place; a ring of "soil" (composed of size, lamp black and chalk) having been painted on to prevent the solder from adhering to the flush surfaces of the lead. The hollow is then filled in level with plumber's solder (see Fig.